Chris Boyle was surfing with friends in the Dominican Republic a few years ago when came up with the idea for the Soloshot, a robotic camera that tracks your every more from about a mile away. "My girlfriend was getting upset being asked over and over again to film us; we had to come up with something," he recalled. 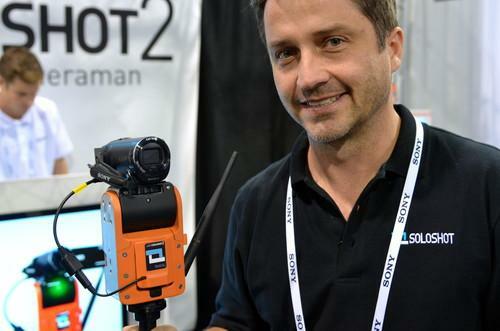 This week he's at the International CES in Las Vegas to launch the Soloshot 2. It's a robotic camera that pans, tilts and zooms to keep you in shot by following a radio transmitter worn on the wrist. It's aimed at surfers, skiers, equestrians and anyone else who wants to film themselves doing something active. Boyle said it's also good for parents who want to film their kid's soccer game without staying glued to the camera. The first Soloshot came out a year and a half ago and the Soloshot 2 improves on that design. It can pan at 80 degrees per second, which Boyle said is fast enough to film a moto-cross bike at 40 mph 30 feet away. The transmitter works at up to 1,800 meters (2,000 yards), and if you go out of range and re-enter the shot somewhere else, it will quickly find you and start following you again, he said. On the waves, you could hand the transmitter to a friend so they can be filmed for a while, then put it back on. Theft is a potential problem, but the Soloshot comes with a K-lock so the camera and tripod can be fastened down. And some people use it where there's no one around to steal it. "We had a guy use it for solo trekking; he took it to the Antarctic to ride big snow-tire bikes. Another guy was surfing remote beaches in Angola. He came back and everyone said, 'Who was with you? You had to have someone filming.'" The Soloshot 2 can be preordered now for $399 and Boyle said it will ship in March. It has a standard tripod mount and works with several camera models. He's also promoting a package for $599 that has everything you need to film, including a Sony CX220 camcorder, a tripod, the Soloshot base and transmitter and a 32GB SD card.